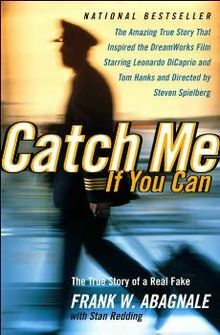 Because I Told You So: Book Report: "Catch Me if You Can"
Book Report: "Catch Me if You Can"
Abagnale pulls off a con job when it comes to the ending. Seemingly uninterested at giving his story any sort of resolution, he just stops and vanishes as abruptly as he did when he passed a bum check or tricked a prison guard into letting him free. The story is amazing, if probably exaggerated to an absurd degree, and the momentum is overwhelming. Abagnale trips things up a bit by obsessively inserting lame similes into every other paragraph, awkwardly making him seem like he's trying to come off as a hillbilly rather than a sophisticated conman. The movie is way better than the book, but could have incorporated more of his crazy scams. Abagnale was a chameleon who masqueraded as an airline pilot, doctor, college professor and prison inspector. The joy with which he recounts his capers is contagious, and the inner monologue with which he rationalizes the moral fortitude of his crimes is fascinating. This seems more like the first half of a deeper, more profound book, but at least it's probably the more entertaining half.